When you think of innovation, the first person that comes to mind is Apple’s CEO and co-founder, Steve Jobs. With Jobs at the helm, Apple has revolutionized the computer, mobile telephone, music distribution and even the book publishing industries with products such as the Mac, iPod, iPhone and the iPad. The book “The Innovation Secrets of Steve Jobs: Insanely Different Principles for Breakthrough Success” by Carmine Gallo looks at the principles that drive the innovation process in Steve Jobs. The principles cover various aspects of life –career, vision, thoughts, customer, design, experience and story. While we can’t all be like Steve Jobs, the book may give you ideas of areas that you can improve in your life, even change the way you think about things. Whether you are an entrepreneur working out of a spare bedroom, a twenty year veteran of an industry undergoing fundamental changes, a college graduate interviewing for that first job, or a small business owner looking for ideas to improve your enterprise, you represent the most important brand of all – yourself. How you talk, walk and act reflects on that brand. Most important, how you think about yourself and your business will have the greatest impact on the creation of new ideas that will grow your business and improve the lives of your customers. Principle 1: Do what you love. Steve Jobs has followed his heart his entire life, and that, he says, has made all the difference. Principle 2: Put a dent in the universe. Principle 3: Kick Start your brain. Innovation does not exist without creativity, and for Steve Jobs, creativity is the act of connecting things. Jobs believes that a broad set of experiences broadens our understanding of the human experience. Principle 4: Sell dreams, not products. To Jobs, people who buy Apple products are not “consumers.” They are people with dreams, hopes and ambitions. Job builds products to help them fulfill their dreams. Principle 5: Say no to 1,000 things. Simplicity is the ultimate sophistication, according to Jobs. From the designs of the iPod to the iPhone, from the packaging of Apple’s products to the functionality of the Apple website, innovation means eliminating the unnecessary so that the necessary may speak. Principle 6: Create insanely great experiences. Jobs has made Apple Stores the gold standard in customer service. The Apple Store has become the world’s best retailer by introducing simple innovations any business can adopt to make deep, lasting emotional connections with its customers. 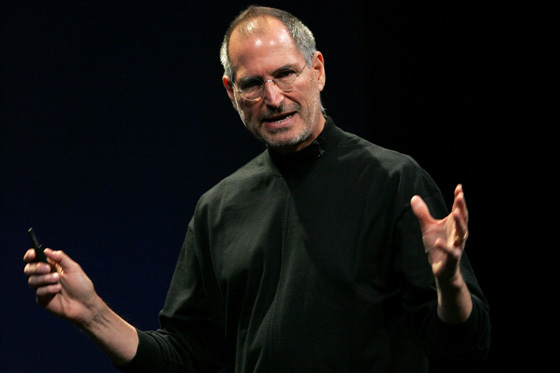 Jobs is the world’s preeminent corporate storyteller, turning product launches into an art form. You can have the most innovative idea in the world, but if you cannot get people excited about it, your innovation doesn’t matter. Another thing might be: be crazy. I think Steve Jobs is crazy but well, I somehow still like him. This post is good and it would be better if it was longer. Every thing is depend on you to make your business grow. thanks for the tips. sidmoses.com a wesite design company in Nigeria for Small and medium Enterprises.